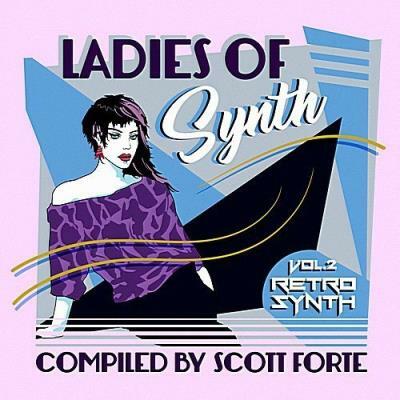 VA - Ladies Of Synth Vol.2 (Compiled by Scott Forte) (2017) | Free eBooks Download - EBOOKEE! Posted on 2019-02-05, updated at 2019-02-24, by nokia241186. "The second installment of RetroSynth Records' Ladies of Synth series raises the high bar set by the first outing, collecting 48(!) tracks by female synth musicians, most of whom operate on the darker, gothier end of the musical spectrum. As the label's name implies, the synths here are thick and chunky, fat streaks of neon smeared across the back of the songs, the rhythms proudly artificial. Above all else, these are pop songs, grounded in assured melodies, and while the synths provide the structure, there's very little experimental noodling or spaced-out sci-fi sound effects. This clears the way for gorgeous tracks like "Two Sides" by The Van Dammage, an improbable combination of '80s R&B vocals with Stranger Things synths that works because the melody is so confident and assured. "Slow Down," by 2DCAT and Tamara, is a blue-light Blade Runner torch song, Tamara's voice winding its way gently through bright bars of electronics. "Dark Places" by Ships in the Night is a haunting bit of goth balladry, and Radio Wolf's "Runaway Girl," featuring Parallels, is a big, unabashed pop banger, with a trillion-watt LED chorus. And while there are a few detours into straight-up synthwave-Moonraccoon's "Showdown" could easily soundtrack some sort of futuristic adaptation of the '80s video game Spy Hunter-most of Ladies of Synth Volume 2 is a bold portrait of retrofuturist pop." No comments for "VA - Ladies Of Synth Vol.2 (Compiled by Scott Forte) (2017)".